Here at our Cape Cod Bed and Breakfast we are almost ready for the big day, Christmas. In historic Sandwich Village and at our Inn we hold nothing back to celebrate the season. We kicked off Holly Days in Sandwich with the lighting of the town Christmas tree, in the center of Town-Hall Square, which happens to be at the end of our driveway. Our guest and a few hundred residents of Sandwich sang Oh Christmas Tree as the massive pine glowed with it brightly colored lights. The festive caroling took place in front of the neighboring First Church of Christ, just as it has since the mid 1800. 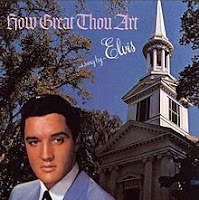 This picture perfect New England church was featured on the cover Elvis Presley’s best selling 1967 album. The Sandwich Chamber of Commerce distributed songbooks and candles to assist those who had forgotten the words. I, like many, may not have known all the words, but I sang loudly and with the holiday spirit. It was cold but no snow fell, unlike a few years ago when the snow was coming done so hard you could not make it through a song without shaking the wet snow off the songbook a few times. To ward off the cold, the Dan’l Webster Inn had set up a hot cider stand under their front portico on Main Street. Many stores were open late and serving hot drinks and sweets. We stopped by to wish Merry Christmas to Lee at the Spotted Cod, a wonderful shop where I know I can always find a gift for Jan, since she loves everything in it. We made our way to the bar at the Belfy Bistro where we gathered around Gary at the grand piano and continued to raise our voices in song. Yes, a little Christmas cheer was also consumed. Holly Days in Sandwich continued when the North Pole Express pulled out of the train station in Sandwich. 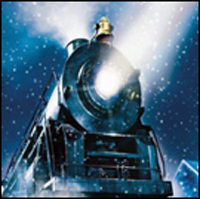 Kids of all ages are delighted to ride this specially decorated Cape Cod Central Railroad train to the North Pole Station (the fully restored, early 1900 station in Barnstable). At the North Pole, visitors saw the elves and Rudolph getting ready for the big night while Santa Claus was checking the list of the ‘naughty and nice’ with a little help form Mrs. Claus. Last Sunday, our Sandwich Bed and Breakfast was one of the featured homes on the annual Holly Days Home Tour. Hundreds of folks took the opportunity to see our wonderfully decorated historical home. 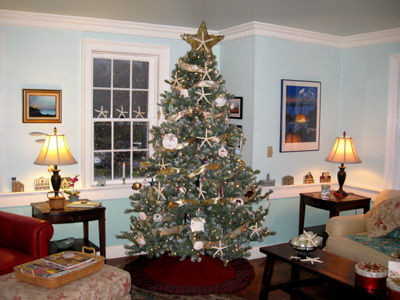 As we are celebrating the 260th anniversary of our Inn, Jan out did herself to lavish our tree and fireplace mantels with starfish and seashells of all kinds to capture the theme of a seaside Christmas. We served breakfast to our guest in front of the fire in the keeping room and then reset the table with our finest Christmas dishes to show the tour visitors how a 1750 Christmas dinner would have looked. As Christmas day approaches, you can still join us for the fun, see our web site for our Holiday specials through New Year’s Eve. The outside lights are aglow and the inside is decorated to welcome you to share our cheer at our Cape Cod Bed and Breakfast.